Mirror for a bathroom is just as refrigerator or stove for a kitchen. Not only mirror provides comfort for performing such daily routines as shaving, applying makeup or just checking on appearance, it also plays a great role in forming interior. Right chosen mirror can optically hide such flaws of bathroom as lack of space and light. When it comes to contemporary bathroom interior, first that comes to mind is functionality as a top priority. Simple clear graphic lines, reserved neutral colors, modern practical materials are characteristics of modern bathroom interior. Every little detail has some practical meaning. Contemporary bathroom interiors, being reflection of big city lifestyle can be performed in any city flat– from tiny studio to rather spacious 2-bathroom apartment. Contemporary interiors can be divided into different styles – minimalistic, modern, high-tech and loft. Modern bathroom mirrors are not the exceptions. Ergonomic features and quality of materials go above design and aesthetics. 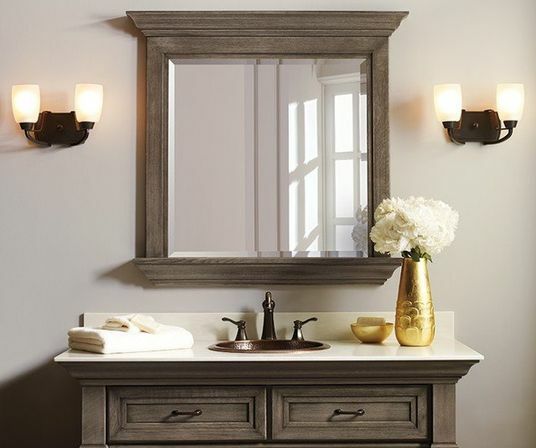 Among various bathroom mirrors modern ones can be recognized by simplicity of shapes and décor. 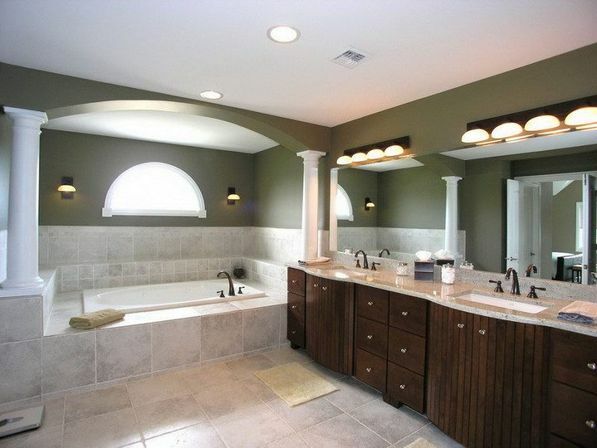 As was said above, modern mirrors for bathroom are first of all functional. This brings the question of quality. 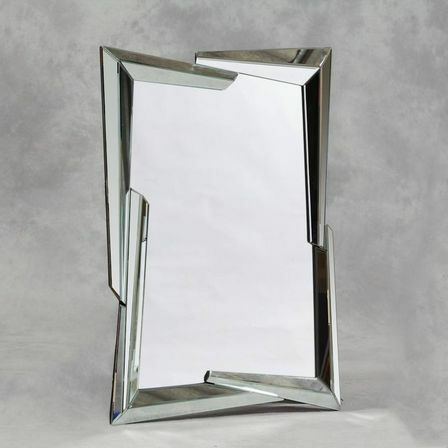 Quality mirror reflects objects correctly and stays in a good condition for a long time. Materials, used for high quality modern bathroom mirror, should be resistant to change of temperature, high level of humidity and condensation. 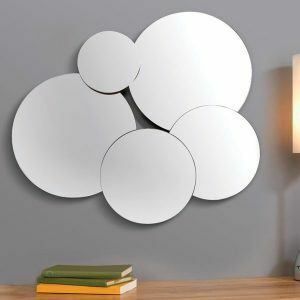 Mirror is supposed to be designed especially for use in bathrooms. Water resistant bathroom mirrors are comprised of glass layer, mirror layer and several protective layers, including anti-corrosion layer. Backside of mirror should be even with no flaws and damages. Mirror frame and all decorative details should be as well protected by anti-corrosion layer. Mirror surface should be flawless – with no scratches, inner air bubbles or discolorations. When choosing mirror, it is better to choose thicker one of 4 millimeters thick or more. Thin light- weighted mirrors often reflect objects with a certain distortion. There is an easy quick test for a mirror. You should take a pencil; place it perpendicularly against the mirror and quickly wave left and right. Curved mirror would give slightly delayed reflection. Yet another key characteristic of high quality bathroom mirror is safety. Any mirror is first of all big piece of glass so it is need to be checked, whether it is it is shock-proof and safe for everyday use. The best type of edge is considered to be so called facet – mirror’s edge, polished at certain angle. Some mirrors are additionally topped with protective film which holds shuttered mirror pieces in case of its break. 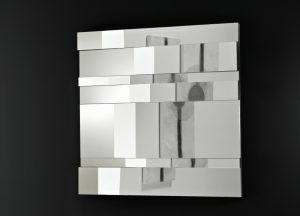 Modern mirrors for bathrooms can be classified by their type. 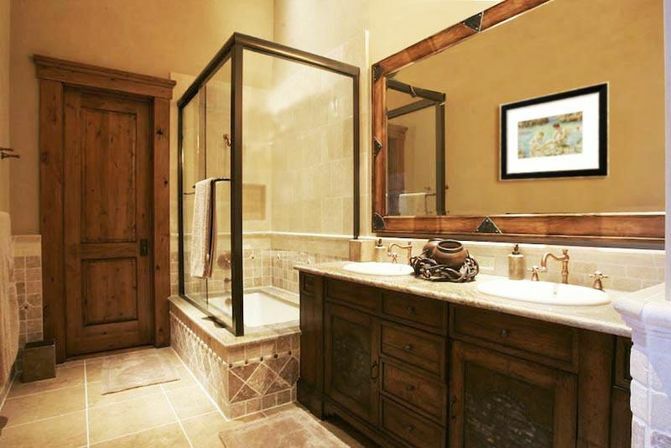 Frameless middle-sized mirrors of various shapes are the most basic and simple ones. They meet main criteria of modern mirrors – pure functionality and suite for any interior – from minimalistic to high-tech design solution. 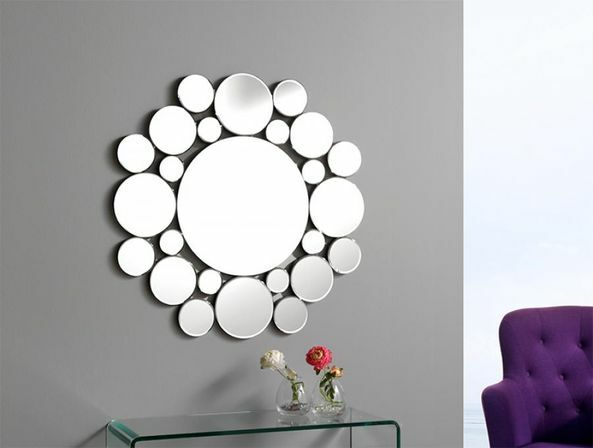 These simple mirrors can be used by themselves or in some combinations: for example, several round mirrors of different sizes would make high-tech styled composition. Or there can be a whole mirror wall, all covered by rectangular frameless mirrors, placed closely next to each other – it works perfectly as a large convenient mirror and at the same time makes any bathroom appear larger and brighter. 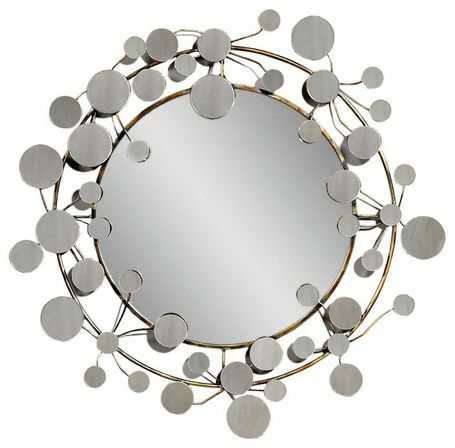 The same mirrors can be framed; for contemporary interiors simple aluminum or plastic frame with minimum details would do. Modern bathroom mirror with shelf provides some space to organize some bathroom necessities. It is usually made of glass and aluminum in laconic style and perfectly fits in all modern interiors, due to its compact size and functionality this mirror is a great solution for small standard bathrooms. Mirror bathroom cabinet is a useful piece of furniture, combining mirror and convenient place for storage of cosmetics and other things. This solution usually comes in modern simple design is perfect for any modern interior, does not require much place. Large mirror is very functional: it gives full-height reflection and visually enlarges the room. 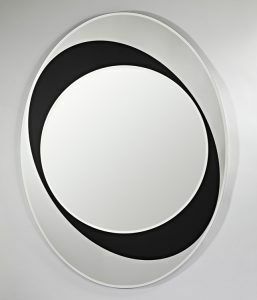 Modern bathroom mirrors come in many shapes. Edgy sharp-lined rectangular shapes would look best in contemporary bathroom environments, though any popular shape would do. For tiny bathrooms round and square shapes can be optimal because they can be very compact. 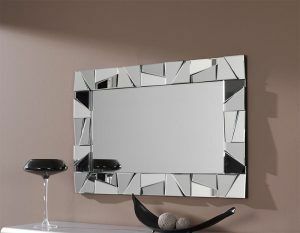 They are also very convenient as vanity mirrors or for creating combinations from several mirrors. 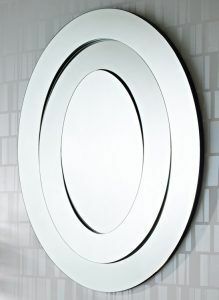 Rectangular and oval mirrors provide more visibility and, if big enough, allow person to see a full height reflection, which is very helpful for getting ready. Rectangular mirror, placed horizontally on the wall, visually widens the room, “setting the walls apart”. Lighting plays an important role in bathroom interior. Modern mirrors, wisely accompanied with proper lighting, can perform many tasks at one time – providing high quality yet flattering reflection; creating an optical illusion of large well-lit room; decorating bathroom and creating cozy atmosphere. Point lights look very stylish and modern, but they are not the best option to lighten up the mirrors, used for applying makeup and shaving, providing not enough and uneven light and causing sharp shadows on the faces. Point lights can be used as additional lighting or by additional mirrors and mirror wall elements, used for decorative reasons rather than for grooming. Best solution for modern bathrooms are lighted modern mirrors which come with built-in lighting fixtures, usually based on LED strip. These illuminated mirrors are very functional – they look good, they distribute enough light evenly on person’s face in quite flattering way and additionally due to LED technology help saving energy and, thus, their owners’ money. Lighting fixtures can be fitted into mirror’s surface and are often made as different geometric or decorative patterns, combining functionality with aesthetics. Another way is when lighting fixture is placed along mirror’s perimeter. Sometimes lighted mirror is equipped with color changing system, this looks very modern. Some color schemes can enhance bold-colored bathroom accessories and can be switched to regular white lighting whenever is needed, creating an original extravagant interior without risk of getting tired of its brightness. 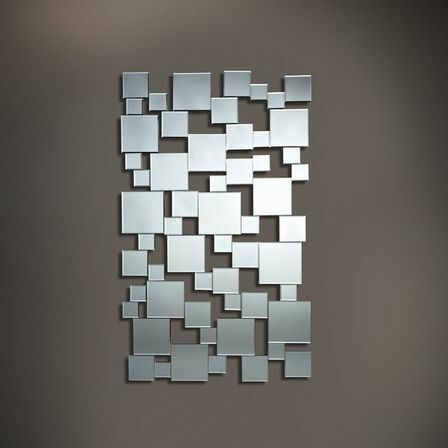 Backlit mirrors give a beautiful illusion of floating. Furnished with modern mirrors, bathroom is functional first of all so it mostly shows simple coloristic solutions and decors. Frameless mirrors’ edges can be processed at certain angle to matt or glossy finish. In modern interiors mirrors with sandblast images look very natural. This modern technology allows applying various designs to mirror’s surface. 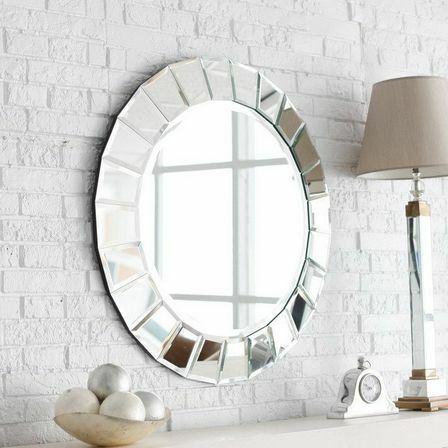 Using tinted mirrors can be a beautiful and practical way to pop some colors into even most minimalistic interior. 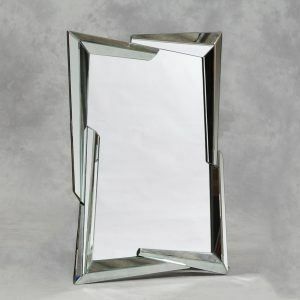 As concerned for modern mirror frames, glossy metallic ones would keep an appropriate style. With modern mirrors bathroom would not only be functional, but would look modern and stylish as well.